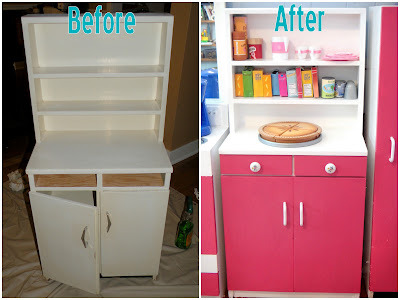 A Fuller Day: My Mini Kitchen Make Over. Long overdue. "Look what I found! Just a little paint and a switch on the hardware." You know those amazing "old school" finds people discover at a garage sales, flee markets, and estate sales? Someone finds some quality piece of something and repurposes it, or finds a new use for it, end result = awesome. If you're like me you think, What? Why doesn't my Goodwill have that stuff? The only garage sales I ever find have particle board furniture from Walmart and Big Lots, and Estate Sales...where? But then it happened. To me. In the summertime, I was driving down a random street a few blocks from my house cutting through and low and behold, a sign "Estate Sale today 11-4." Out of sheer curiosity I had to make the stop. The story sounds too cliche to even be real. An old lady had died who had lived in the house for a long time. She was into sewing and had traveled a lot when she was younger. Her house clearly reflected this, as it was filled with interesting, old, and very "vintage" type items. You vintage lovers out there would be swooning. Most of the really "cool" stuff had "sold" tags on it-furniture, antiques, dishes, awesomeness items, etc. But there were still some finds to be had. I ended up going home with 2 pieces of furniture I had a use in mind for, and a 3 piece solid wood child's kitchen set that was tucked away in the corner of the basement. My girls already had a play kitchen, but it was very tiny, plastic, and you could only fit 2 pieces of play food in the fridge if you were luck. I just couldn't pass this up. The fridge was roomy, it had a cute little oven/stovetop that you could actually fit pots and pans inside, set complete with an adorable mini hutch cabinet. It reminded me of the play kitchen my grandpa had built for me when I was a little girl. The nostalgia, mixed with the bargain hunter inside me made the deal. The kitchen was solid wood and painted with some sort of creamish colored semi gloss paint that had faded. I just washed everything out with soapy water, unscrewed the old hardware, and primed it with a white semi gloss paint and primer in one, from Lowes. Then I added a deep raspberry semi gloss to parts of the set, and bought some new hardware to go with the new look. The fridge was so roomy, we actually packed away some bins we had because we could fit all our play food and more inside. My camera ran out of battery so you'll just have to dream about the oven and refrigerator for now! I'll take a better pic later. Sweet new little white nobs with flower and some white handles. 99cents a piece. For you vintage lovers, the little hutch even had some throw back play food mixes, the kind with a block inside. Pretty cute. Really sweet. Def better than the plastic and what a deal. I'm going to be lookng next summer.